Does the site accept real-money players from the United States? If so, from all states, or are some states barred? What is the new play offer, its limits, and its playthrough requirements? What are the deposit methods that are offered to which countries, and what are their limits, fees, processing times, and how frequently can a deposit be requested? What are the payout methods that are offered to which countries, and what are their limits, fees, processing times, and how frequently can a payout be requested? To make it as simple as possible to locate this information about online gambling sites, I have spent may hours tracking down and compiling this information into The Single Page Online Gambling List. It’s a long page that ain’t pretty but it is functional — it displays all the basic information that I described above for top online gambling sites. Currently, it lists 14 online casinos, 4 online poker rooms, and 4 online sportsbooks — representing the best-of-the-best, 5-star sites from my Online Casino Gambling Directory. As time goes on, more sites will be added to the list. If you like a site, click on the site’s link from The Single Page Online Gambling List. You can click on the site’s name at the top or the bottom of the site’s summary table. Tell your friends. Please share The Single Page Online Gambling List with them via email, social media, etc. I’ve been playing at every conceivable online gambling site for over 10 years. If you have any questions, feel free to reach out to me. My email address, and other information about me and my site, is listed on the About The Online Casino Gambling Directory page. 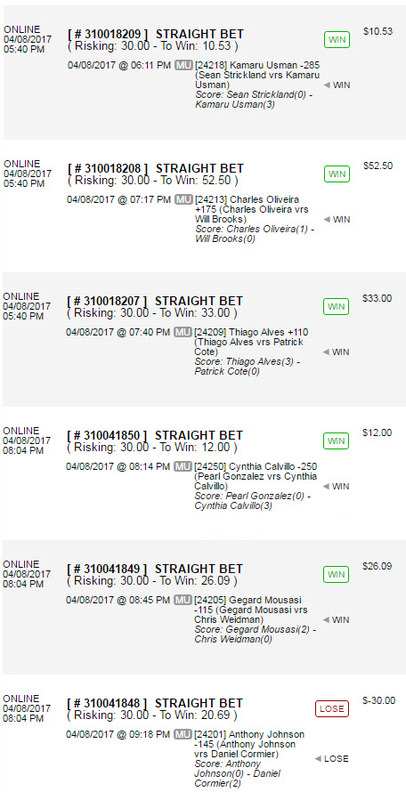 At last Saturday’s UFC 210: Cormier vs Johnson 2, I went 5 of 6 at the Americas Cardroom sportsbook. On Sunday, I requested a payout of my winnings. They offer one free check payout per month, with a low $100 minimum. I’m happy to report that the check arrived Thursday, with no hassles, delays or unnecessary requests for additional information. In today’s online gambling landscape, Americas Cardroom‘s payout policy really stands out. It is RARE indeed that a site offers free monthly payouts with such a low minimum. It’s one of the reasons that Americas Cardroom is one of the few 5-star sites at the The Online Casino Gambling Directory. Americas Cardroom has a poker room, casino, and sportsbook. Real-money players from the USA are accepted. If you enjoy playing MTTs but like to keep the buy-in cost in check, Mondays are the day to play online poker at America’s Cardroom. But a low buy-in doesn’t mean you can’t score big! You can literally parlay a few dollars into hundreds through these low stakes tourneys. With start times beginning at 2 PM Eastern, there are five MTTs with very low buy-ins each Monday at America’s Cardroom. The last of the five MTTs starts at 10:05 PM Eastern. It’s been more and more difficult in the past years to find a good, reputable online poker room that accepts players from the United States. I’ve just completed a month-long audit of a dozen online poker sites that accept players from the United States. Here are the best online poker sites based on ease of depositing, games offered, the software itself, customer support, ease of payout, and payout fees. Features credit card cashouts for just a $9 fee! You can always find the most up-to-date listing of USA online poker sites on the USA online poker page of The Online Casino Gambling Directory. As always, please check all relevant laws and regulations in your area before playing online poker for real money. Set your clocks for this weekend’s Texas Hold’em Bounty Tournament at Juicy Stakes online poker room. The poker tournament has a $500 guaranteed prize pool, and a very small $3.30 buy-in. The texas hold’em poker tournament starts Sunday, November 1, 2015 @ 22:00 GMT (04:00 EST). In addition to the standard prize pool paid out to the top finishers, you can easily make back the entry fee in bounties. Each player has a $1 bounty on their head — knock them out, collect the bounty! Juicy Stakes online poker room accepts players from nearly every location in the world, including players from the United States. For a limited time, Juicy Stakes online poker room is part of the Revolution Poker Network and is currently offering a 200% bonus up to $1K to new players. Oh, how things have changed since 2005. Unlawful Internet Gambling Enforcement Act of 2006 : A rider on a “must-pass” port security bill, the UIGEA resulted in the banning of US players by 100s of online gambling sites. There are still several dozen online gambling sites that accept US players, but only a fraction of the number that were available prior to this act. In 2008, Kentucky attempts to seize gambling site domains in an effort to stop illegal online gaming. Sites are down for at most a day or two; most just redirected to a .net or .eu domain. However, many online gambling sites now specifically ban players from this state. Absolute Poker / Ultimate Bet Online Poker Cheating Exposed on 60 Minutes in 2008 : Savvy players analyzed online poker hand histories and discovered statistical anomalies that alerted them to the cheating. Former owner Russ Hamilton has since admitted his guilt in this scandal, having stolen around $17M. Online Poker’s “Black Friday” of 2011 : Online poker in the United States is decimated as PokerStars, Full Tilt Poker, and Absolute Poker were indicted on charges of bank fraud, money laundering, and illegal gambling. It still has not recovered. Settlement talks are ongoing, some agreements have been reached, and some of the brands are attempting to make a comeback as US states begin to legalize and regulate intrastate online poker. 2012 to present, states are moving to legalize and regulate intrastate online gambling. Nevada, Delaware, and New Jersey all have some form of legal, regulated online gambling, with California, Washington, and other states not far behind. States are essentially claiming that online gambling, like lotteries and land-based casinos, are the purview of the states and not the feds — and it seems like no one is going to challenge that. The rate at which new online gambling sites come online has rapidly decelerated. Years ago, there were several new sites a month; now, I rarely hear about a new site coming online. Many of the disreputable sites have gone out of business. Of the online gambling sites that remain, the vast majority are reputable, have been around for years, and have all the hallmarks of being in business for years to come. Online gambling sites have adapted their sites to tablets and mobile phones; more and more players are playing on their iPads, iPhones, and Android devices. Just recently in the United States, some online gambling sites are paying out winnings to a player’s credit card. An all-electronic deposit and withdrawal system is necessary for widespread adoption of online gambling. Pre-UIGEA, NetTeller filled this role, but they were busted, paid fines, relocated from Canada to another jurisdiction, and currently steers clear of all United States markets. Intertops Casino, Poker Room, and Sportsbook has recently deployed CardPay as a payout method. CardPay pays your winnings to a credit card that you had previously used to make a deposit. There is a small $9 fee per transaction, and it can be used to process payouts of between $100 and $5000. The payout takes between 3 – 7 business days after your payout has been approved by Intertops. You’ll be hard-pressed to find a more affordable or convenient payout method at any online gambling site. If you don’t already have an account at Intertops Casino, Poker, and Sportsbook, you really should sign up. Play at the casino, in the poker room, and place your sports bets all from a single account. Here are the current bonuses that Intertops is offering its new players. Casino: 100% bonus on initial deposits of between $20 and $100, with a playthrough of 30 x (deposit + bonus). No cap on winnings. Use bonus code SIGNUP100. Poker: 200% bonus on initial deposits of between $20 and $500, released in $5 increments based on your play in the first 90 days. Also, entry into their $500 new depositor freeroll (top 3 pay out as: $250 / $150 / $100). No cap on winnings. Use bonus code 1000ITP. Sportsbook: 20% bonus on initial deposits of between $20 and $500, with a playthrough of 8 x (deposit + bonus). No cap on winnings. Contact support after making your deposit to claim this bonus. Intertops accepts real-money players from all US States, and is one of the very few to accept real-money poker players from all US States. Click here to sign-up at Intertops! America’s Cardroom is offering players a chance for a seat to the 2015 World Series of Poker (WSOP) for just $0.01. Wager $0.01, $0.05, or $1.00 on their Spin to Get IN game, and when you hit three of a kind, you’ll win anything from entry into a WSOP satellite all the way up to a WSOP Main Event Package valued at $12,500. America’s Cardroom accepts players from most US states, and from most countries around the world. ACR jump starts every player with an incredible 100% first deposit bonus up to $1,000! As a new member you’re not only entitled to earn extra cash via our monthly progressive rake race The Beast or numerous other promotions, but you release bonus cash matched by ACR with every hand you play! Your first deposit is earning big returns on all fronts! Not only will you be getting promotional cash pay outs and tournament tickets from The Beast along with extra points towards your Elite Benefits Rank, you’ll also receive a 100% return on your initial investment as you release the cash on ACR’s easy to clear bonus. It really is as good as it gets. To take advantage of this great offer, simply make your first deposit and play. Remember when online poker freerolls were being run nearly all the time? Between five or so different online poker sites, it seemed that there was always an online poker freeroll to join at the top of the hour, practically 24 hours a day, every day, all year long. Sadly, those days have passed. But Juicy Stakes is bringing back the past by spreading three online poker freerolls every day. These start at 4.30 PM / 6.30 PM / 8.30 PM EST, and award tournament entries to the top 15 players. And they are also spreading an additional three online poker freerolls each week in January, with CASH prizes. All you need to do is download and register with Juicy Stakes, then sign-up for the freerolls before they are full. One point about cash winnings at the freerolls… 50% of the freeroll cash winnings have to be turned over as gross rake, before you’re eligible to withdraw. Juicy Stakes accepts US players from all states, in addition to players from many other countries and jurisdictions. Online Casino Gambling Directory. The latest free offers, promotions, news, and information about online poker, casinos, bingo, sports betting, and more.